Both motherboards support AMD's latest Ryzen processors (up to 95W TDP) and the upcoming 7th Generation A-Series APUs, which should be no problem for the 7-phase power design. Given their specialized purpose, these motherboards only have four SATA 6Gb/s ports and no M.2 slots. USB connectivity is quite decent with six USB 3.1 Gen1 ports (four rear, one header) and six USB 2.0 ports (four rear, one header). Two of the USB 2.0 ports are high amperage capable, so they can handle water pumps and/or fans that require up to 1.5 amps. Networking duties are handled by one gigabit LAN port that is powered by a Realtek RTL8111H controller. In terms of rear I/O connectivity, aside from the aforementioned ports, there are two legacy PS/2 connectors, a single DVI-D video output, and three audio jacks courtesy of a low-end Realtek ALC887 codec. The key selling point of these two models is obviously their six PCIe slots. They each have one PCIe 3.0 x16 slot, two PCIe 3.0 x1 slots, and three PCIe 2.0 x1 slots. The PCIe x16 slot will operate at x8 if an APU is installed, due to AM4 APU limitations. 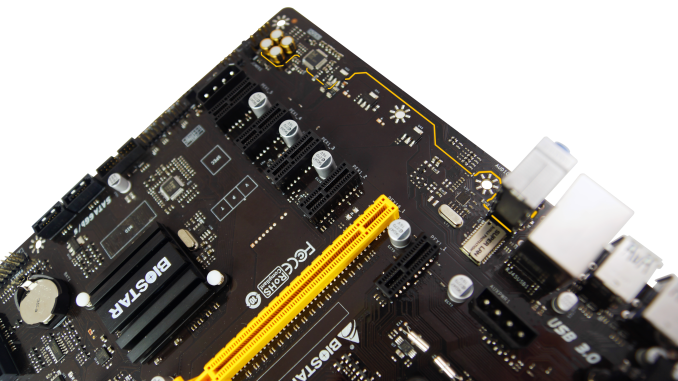 Now you may be asking how PCIe x1 slots are useful when it comes to handling multiple graphics cards, and the answer is that miners use PCIe 1x to x16 riser cards with flexible extender cables (not included) and special cases that hold the graphics cards well above the motherboard. Crucially, there are also two 4-pin Molex power connectors intended to bolster power delivery to the PCIe slots, and they must be used when mining due to the increased power demands. While full-size ATX motherboards generally measure 305mm × 244mm, these two models are both slightly shorter and narrower than the ATX standard at 295mm x 210mm. 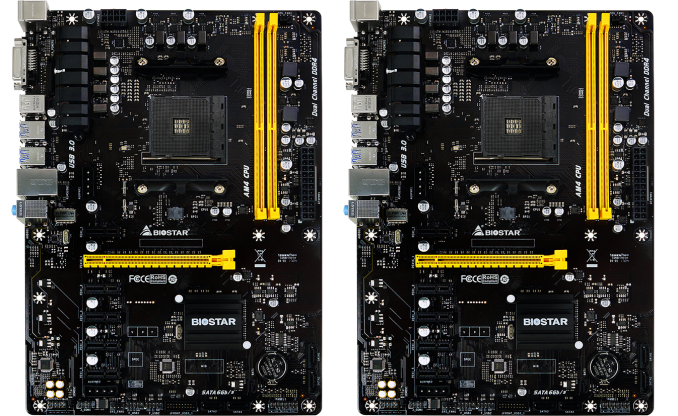 That may cause issues with certain cases, but BIOSTAR is likely betting on the fact that those who purchase these motherboards will be installing them on purpose-built open test benches. We have no information with regard to pricing or availability, but both models will have a 3-year warranty in applicable regions. We expect the pricing to be quite low, given the margins that miners typically work with. Mining aside, any non-PCIe bandwidth limited task for compute, using OpenCL / CUDA and such could also be used. Yeah, a dedicated ASIC designs are much more impactful than general purpose GPU or CPU mining. Also, kind of feel that that the whole crypto-currency thing has been a get-rich-quick meme that needs to die off already. Yeah, I understand that there are plenty of people that do make a quick buck on it, but the reality of the situation is that cryto-currency mining is such a saturated field that to get any crypto-currency at profitable rates (to not only pay off the capital or dedicated machine(s) designated to mining, but also the electricity costs incurred with the machine(s) and A/C costs) you need a pretty massive investment to "get rich quick" and you're still subject to the awfully variable values of the crypto-currency day-to-day. Using crypto-currency as a pseudo-stock market is a bit better, because at least you're not dealing with the baggage of mining it yourself (where any crypto-currency worth its salt has such a high complexity for resolving chains that you'd need weeks to get 1 bitcoin, for example, or join a mining team where the bitcoin is shared amongst miners, but always in favor of the organizer of the mining team). But at the end of the day it's still such an absurd fluctuation where for every 1 person that "got rich quick" 5 others probably got real poor, real quick. You don't understand the fundamentals of crypto-currencies. They are there to support their own blockchain--the distributed ledger to keep the information. The money aspect is only there as an incentive to support their blockchain. There are cyprto-currencies which are work by various proofs other than proof of work, that is you don't need to do large hash computations. Some work just by holding--the longer you hold, the more value your share is. Others work by proof of storage--by sharing storage which provides the fundamental units of the blockchain. The storage portions themselves then is monetized, rather than hash computations. Ethereum works by proof of work, so traditional hash computation on cpu/gpu (no ASICs), but the main purpose is NOT the money. It's to support the decentralized, automated, programmable contracts that can be "set in stone" between two parties in the ether (the ethereum blockchain). "Crypto-currencies [...] are there to support their own blockchain--the distributed ledger to keep the information. The money aspect is only there as an incentive to support their blockchain." What use is a blockchain without a unit of value attached to it, other than being a hopelessly inefficient database? "[Ethereum] is to support the decentralized, automated, programmable contracts that can be "set in stone" between two parties in the ether (the ethereum blockchain)." And didn't that turn out well with the DAO. "You're thinking of value in dollars, and that's the wrong way to think about it. It's value is in what it's traded at, so various other currencies, cryptocurrencies and direct goods." "What use is a blockchain without a unit of value attached to it, other than being a hopelessly inefficient database?" A distributed ledger is a replacement for centralised transaction processors. To use an analogy, Bitcoin is not a replacement for cash or Paypal, it's a replacement for processing networks like Visa and Mastercard. Though by removing the requirement for a central authoritative account server, it replaces all parties in the loop between the 'card' (for Bitcoin this could be a physical cryptography card but is usually a mobile device or other computer with a wallet key) and the terninal. And all this will be much more reasonable once a credible authority (a central bank) employs it.